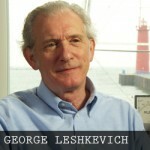 PROJECT: ICE director and executive producer, Bill Kleinert, sits down with Physical Scientist George Leshkevich at NOAA’s Great Lakes Environmental Research Laboratory in Ann Arbor, Michigan, to discuss ice cover on the Great Lakes. Bill Kleinert discusses PROJECT: ICE which was recently featured at the Environmental Film Festival in Washington, DC. © 2016 Tillinghast Reid WorldWide, LLC All rights reserved.